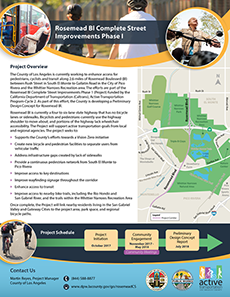 The County of Los Angeles was awarded grant funds by the California Department of Transportation (Caltrans), Active Transportation Program-Cycle 2 to develop a Preliminary Design Concept for a complete streets treatment on a 2.6-mile segment of Rosemead Boulevard (Bl). 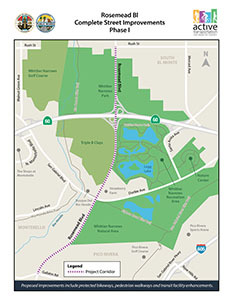 The project, officially known as the Rosemead Boulevard Complete Street Improvements Phase I, is a six-lane divided highway with no bike facilities and isolated sidewalk segments on the overcrossing for the State Route 60 Freeway. Currently, pedestrians and bicyclists must use the roadway shoulder to travel along this corridor, which presents a safety hazard and limits residents and visitors from traveling along the corridor using these modes of transportation. As a result, the majority of visitors primarily drive to the park. The lack of bike and pedestrian infrastructure prevents safe and convenient access for those users to most of the park's facilities. The Project will provide a solution to this problem and increase the mobility options for all users. Once complete, the Project will link nearby residents living in South El Monte and Pico Rivera to the project area to park space and regional bicycle paths, inviting more residents to utilize the facilities and engage in physical activity.